Arif, A.; Guettaf, A.; Sbaa, S.; Benramache, S.: ''Electromagnetic Characteristics Correlated with the Excitation Current and the Rotor Position in the SRM''; International Journal of System Assurance Engineering and Management, Vol. 1, No. 1, pp. 1-8, July, 2015. Ramzi, S., ''Modeling and Simulation of Photovoltaic Pumping System'', Supervisor: Guettaf, A., University of Biskra, Algeria, 2018. Fouzi, L., ''Technical and Economical Study of a Photovoltaic Pumping System'', Supervisor: Guettaf, A., University of Beira Interior, Algeria, 2017. 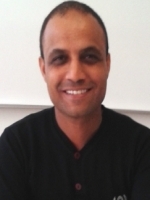 Eddine, C. N., ''Optimizing a Supervisor for Renewable Energy'', Supervisor: Guettaf, A., University of Biskra, Algeria, 2017. Farouk, B., ''A Comparative Study of Different MPPT Control Techniques for Photovoltaic Systems'', Supervisor: Guettaf, A., University of Biskra, Algeria, 2016. Djebbar, W., ''Modeling and Control of an Asynchronous Generator Associated to a Wind Conversion System'', Supervisor: Guettaf, A., University of Biskra, Algeria, 2015. Benali, O., ''Switched Reluctance Machine Modeling Using Finite Element Analysis with Torque Ripple Minimization'', Supervisor: Guettaf, A., University of Biskra, Algeria, 2015.